Some horror movies leave audiences playing a haughty game of "if it were me I'd do this," but when it came to the Saw franchise, nobody wanted to play anymore. John Kramer initially pegged himself a non-serial killer who only wanted to force depressed sots into appreciating and fighting for their lives, since he'd received his own death sentence of incurable cancer and didn't appreciate his physicians' clinical approach to the diagnosis. But at the end of the day, he and his minions rained Hell upon a whole lot of people just for the sake of getting to grin at others suffering. What started out as a fever dream project for a couple of film students became a full-on franchise of gore, and some of the installments were better than the others. Here's a ranking of all the Saw films so far, starting with the worst. The eighth installment-slash-revival of the Saw franchise had to start fresh after The Final Chapter said "game over" to most of the series' most prolific plot points. Instead of bringing back Dr. Gordon or another known name to carry out his bidding, the movie introduced a new survivor-turned-killer to the fold. 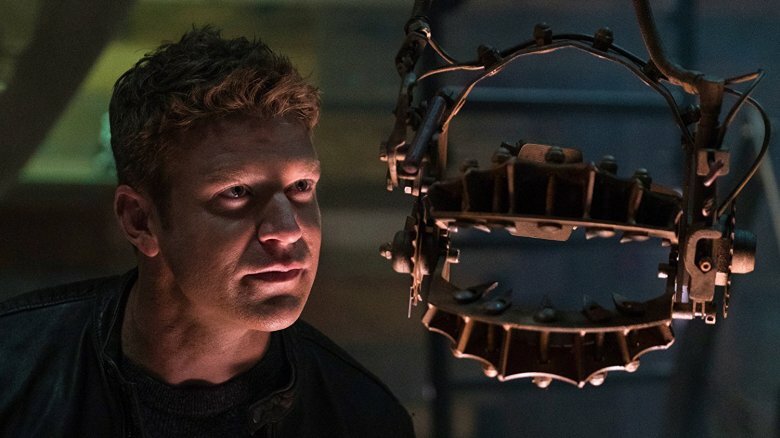 By jumping back 10 years to play out one of Jigsaw's old and largely unknown group traps, we're introduced to Logan Nelson, a mortician who's sneakily investigating the cadavers of his own victims while copycatting John Kramer's work to deliver justice to several dangerous criminals and the police officer who helped set them free. Of course, none of this is apparent throughout the whole movie, as tricky editing and clever cutaways guard the secret of Logan's true identity 'til the very end, after he finally ensnares his mark. Everything that's happening to Jigsaw's victims seems to be in real time, making the third act a whirlwind of explanations and montage moments. It's a suitable sequel and certainly carries forward the atmosphere and carnage Saw fans have come to know. However, apart from introducing a Jigsaw superfan who's obviously got some secrets up her sleeve worth exploring in later pictures, it barely offers anything new and leaves some very loose threads dangling. By the time the seventh piece of the Jigsaw puzzle came into play, this series looked almost nothing like the original. Detective Hoffman was so busy running around cleaning up his own messes (and making many more along the way) that the day's games seemed like an afterthought meant only to follow formula. In fact, there were two major group traps that were completely devoid of value to the overarching plot. Whoever thought it was necessary to have a man rip all the skin of his back off in 3D might just be sicker than Jigsaw. While there were a few elements of redemption—particularly, Jill Tuck being targeted and Dr. Lawrence Gordon making a long-overdue comeback to the series to tie up a few loose limbs—the movie was frustratingly disjointed. Hoffman's Terminator-style assault on the entire police department was absurd and laid waste to the entire framework of Jigsaw's "legacy." Saw 3D: The Final Chapter ranks dead last on this list. The movie might have been more interesting if it'd focused more on Jill and Dr. Gordon. But instead we got yet another full-length Hoffman feature, and since his intrigue had long expired by then, he was left with nothing to do except destroy everything that made the series unique. Fail. Whereas Saw II's house-full of victims were mostly criminals who'd (probably) hurt others, making their ghastly deaths a little easier to endure, the central figures in Saw III's round of nefariousness were completely sympathetic. The father of a drunk driving victim was made to face all the figures involved in the accident that took his son and decide if they should "live or die." 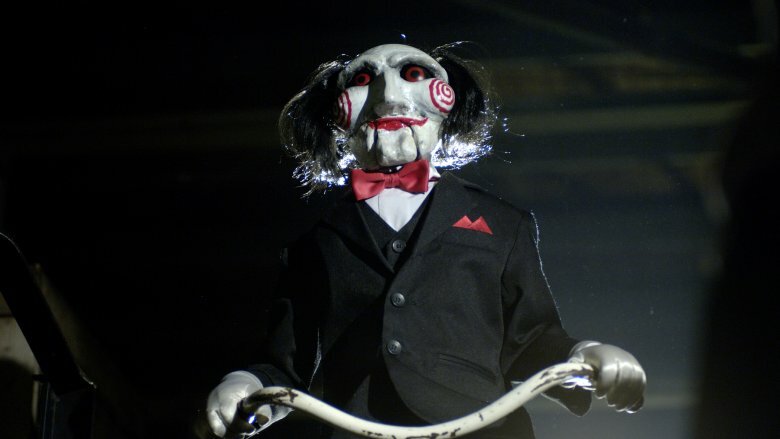 Meanwhile, a trauma surgeon, later revealed to be the cheating wife of the first victim, was tasked with keeping Jigsaw alive long enough to see things through and, ultimately, became a pawn in Amanda's test. Considering how sad this couple's situation was to begin with—what family wouldn't be in ruins so soon after that kind of loss—and the fact that there was a second poor kid caught in the crosshairs, Jigsaw's elaborate death knell for each seemed particularly cruel and contrary to any philosophical justification he might've offered before. Some of the traps in this movie were exceptionally gratuitous. Plus, the connective tissue needed to flesh out all the plot dives with Jigsaw and Amanda here was annoyingly thick (if you need a full five-minute flashback montage to explain one simple story revelation, it's not working, folks). But most importantly, the choice of victims here seemed to exhaust the whole generous Grim Reaper identity Jigsaw crafted for himself, so it lands very low on the list for that reason. The running involvement of Detective Hoffman—under the gun as he watches the two remaining FBI agents thirstily chase his tail—successfully sprinkled a few in a few key details about the inner workings of John Kramer's competing cohorts. Plus, the voyeurism exhibited Hoffman's first copycat game was a clever, albeit probably unintentional metaphor for the series as a whole. But by the time the sixth film came along, the spate of drug addicts and police officers who'd somehow run afoul of John Kramer and Co. had already been killed off. So, Jigsaw's posthumous games, carried out by Hoffman, got a bit more political. A pair of predatory loan sharks and one particularly nasty insurance adjuster were instead among the tested targets, and while the intention here might've been ambitious, the plot became flimsy rather quickly. The villainization of all these corporate types was tired before it even began, so the effort to pin all the ills of John's insurance woes on one guy fell completely flat (thanks in large part to some pretty awful acting). It was a nice try, to find yet another thread to tug on when it came to John's original ills with the world, but it became stock schlock long before the timer ran out and lands near the low end of this list. Kudos are due to Darren Lynn Bousman for sticking to his decision to continue Saw IV on the same puzzling plot path as its predecessors and add a new layer to John Kramer's wretched rationale (with a drug addict essentially killing his unborn child in pursuit of a fix). The addition of Jill and the dissolution of hope John experienced for a reason wholly outside of the cancer patient line was clutch. And, yes, we really did need a few more secondary psychos to fill in all the timeline gaps, especially once John Kramer had gone bye-bye. As with Saw III, though, the central player of this film's games, Lieutenant Rigg, was wholly undeserving of his trial. So what if he was passionate about his job and missed out on a family vacation or two? The punishment never really matched the crime in this series, but especially so for Rigg. The clever culmination of events at the end was a fresh surprise that saved this story. The ghastliness of the deaths on display was handily overshadowed by the deep dive into how Jigsaw came to be such a twisted individual in the first place. And the fact that he was still in control of his crew, even while cold on the autopsy table, was delightfully bonkers and managed to renew any waning interest in what was next. But the plot's circulation of Rigg was lame and makes this movie a very middle-of-the-road leg of this series run. As Detective Hoffman embraced his role as the lone soldier left from John Kramer's kill crew, he had one major problem on his hands: Special Agent Strahm, who, like Detective David Tapp in the first film, refused to give up on his guy and found himself hot on Hoffman's trail. 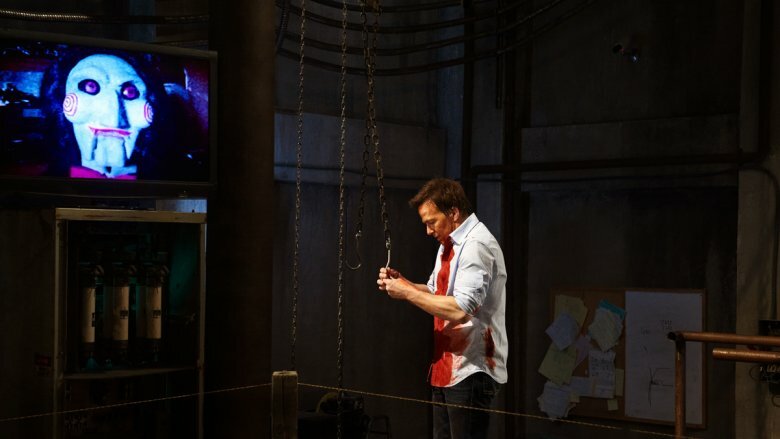 Unlike some of its predecessors, Saw V's strength lay in its precision of purpose with each killing. The film focused on characters that, while terrible, were still smart enough to consider pausing to use their brains before engaging those mechanisms that would cause their eventual demise. Not only that, but the game of cat and mouse that ensued between Special Agent Strahm and Detective Hoffman was, by and large, pretty epic and harkened back to the first film's element of obsessive investigation. This wasn't just another senseless police slaughter session by the men and women in pig masks, in other words. The gore of the games, too, seemed to temporarily taper off at this point, leaving a little more for the sound effects team to color in rather than exploiting the visual angles. This film's return to a teamwork element in the games, along with less pitiful victims, was a smart and satisfying continuation of what made Saw II stick. And the passionate pursuit of Strahm culminated in a crushing twist ending that was as jaw-dropping as anything that came before it or after. James Wan stepped away from the first sequel and Leigh Whannell's duties were reduced to co-writing the script, but director Darren Lynn Bousman still managed to avoid some "second verse, same as the first" sequel stagnation with Saw II. Instead, the film expanded the world that'd been established in the first installment and offered a new vein of intrigue for the subsequent sequels to float on. The original backbone of a selected group of victims, stuck in some souped up doom room (this time, a house) where they're racing against the clock and fleshing out their own shared histories completely elevated the original idea. On top of that, the flick's subplot of police brutality would inform the rest of the franchise, and the movie gamely answered the lingering question of "what actually happens to the survivors" with the surprising return of Amanda and opened the door to a series-long exploration of this character. The film's ability to merge the central test of the day with another, much more personal challenge for Detective Matthews was very compelling. The plot here was very polished and successfully ran with the concept of the original. Were it not for the novelty of the original film, Saw II might rank first. 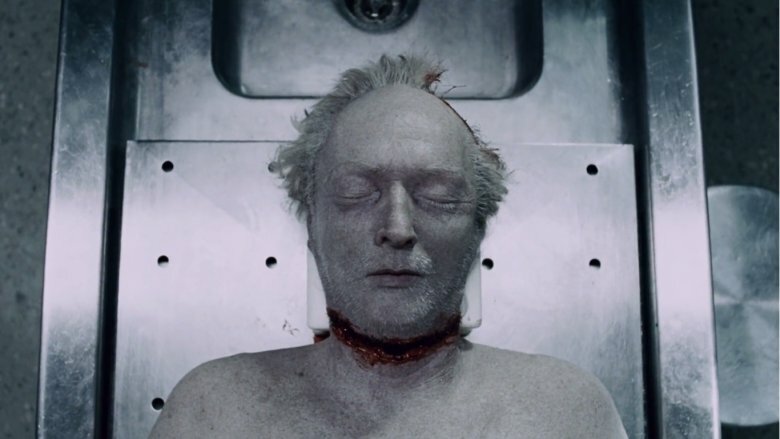 There was something very artful about Saw's approach to the macabre that made the movie such an indelible experience. The puzzle pieces of skin taken from victims' bodies, as Jigsaw/John would later explain, were gnarly symbols of what was missing from people's lives. But they were also a metaphor for the audience's job in gestating everything that happened in the film and spawned a severe interest in seeing more of what the messed-up minds of then-industry newbs Leigh Whannell and James Wan could come up with in the way of those traps. From the surprisingly effective small-scale setting of two (and a half) people locked in a bathroom playing a game of Clue for their lives, to the whirly-cam montage modality of showing off other terror traps, to the chilling sounds of Charlie Clouser's series-defining score, Saw opened the door to much more interest in exploring the sick, sad world of Jigsaw. Especially after it ended on such a twist that it was decidedly not "game over." Saw was far from perfect. The film had some moments of lazy acting and low-budget camera angling that are pretty cringeworthy upon review. However, even if it didn't boast the slickest cinematography known to Hollywood, Saw was still an original and very disturbing abstraction for the auteurs to explore and was executed with impressive efficiency and invention. It's still number one.